A real, live, Christmas tree, festooned with its baubles, lights, tinsel and chocolate goodies, watched over by the fairy at the top is a key part of many families Christmas celebrations. Choosing your Christmas Tree, is a huge part of Christmas, at Kershaws Garden Centre we have had the same family’s coming back to us for years to buy a tree. We have been doing it for so long, the kids now have there own kids, who they bring along to choose a Christmas tree and the excitement they get in choosing their own tree and seeing it being put through the netter is infectious. A close relative of Norway Spruce, this tree is best known for its two-tone foliage colour. Whilst the needles are green on the upper surface, they are blue underneath. This gives the tree an attractive blue/green appearance. Serbian Spruce originates from the Drina River Valley in Serbia and Eastern Bosnia. It naturally produces a dense, narrowly shaped tree. The most popular Christmas tree variety by far. 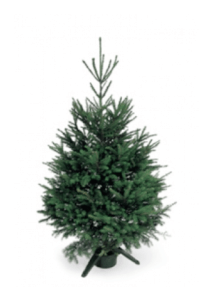 With a classic Christmas tree shape and long, soft, dark green needles it has excellent needle holding properties. Nordman Fir originates from the Caucus Mountain range which divides Turkey and Georgia. 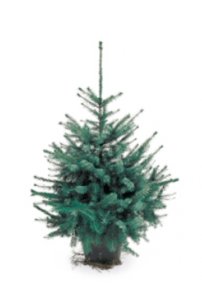 The traditional Christmas tree with short, green needles. 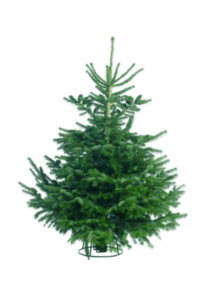 Why should I buy my tree early if I only put it up just before Christmas? There is a limited supply of Quality trees, you should buy early to ensure you get the size you are looking for. You can then store it outside until you are ready to put it up. When should I bring my tree indoors? To give maximum satisfaction over the 12 days of Christmas, ideally your tree should be brought in as late as possible. The earlier you bring in the tree, the earlier it will lose some of its freshness. You should still buy your tree early to ensure you get the tree you want but you should leave it outside sheltered from the wind until you are ready to put it in your living room. Should I cut the stem? It is essential to cut 2.5cm from the base of the stem before placing the tree in water and bringing indoors. Should I water the Tree? Place it in a water filled stand. Give it a drink of water every day. Please note it is pointless giving the tree water unless you have trimmed the base to let it drink. Which stand should I choose? There are a variety of stands that will accommodate even the largest tree stem, while ensuring that the tree can drink water. A one off investment in the correct stand will make your life easier and ensure a fresher tree each Christmas. What temperature should it be, to keep my tree fresh in the home? Keep the temperature at or below 20ºC. Keep the tree away from heat especially direct heat.